The Guiana Shield is one of the largest blocks of primary tropical forest worldwide as well as a eco-region with very high biodiversity levels. With 90% covered with intact rainforest, it plays a critical role in mitigating climate change and in water regulation of Amazon and Orinoco basins. Until a decade ago, the Guiana Shield forests were under little threat in comparison with other tropical forests. However, countries are burgeoning economically and demographically, leading to increasing pressures on natural ecosystems. The governments are keen to drive their development in a sustainable manner and in that perspective, they have shown strong interest in REDD+ as a mechanism that would enable to financially value their efforts, thanks to carbon revenues. The project “REDD+ for the Guiana Shield” was initiated, at first by Guyana, Suriname and France, shortly after joined by the state of Amapá in Brazil, at the occasion of the UNFCCC’s fourteenth Conference of Parties, held in 2008 in Poznan. The project aims at providing information and tools to be used by countries to establish sound science-based policies and measures to tackle deforestation and degradation, in the framework of REDD+ mechanism. Cooperation is a key and strategic component of the project. While in the same eco-region, Guiana Shield countries have different histories and developed their own priorities. There are therefore significant opportunities to share information and good practices in the region. The project will encourage cooperation between neighboring countries on REDD+, thanks to a technical and regional platform that will focus on inventory of the resources (carbon stocks and forest cover), improvement of the quantified understanding of drivers of deforestation and degradation, as well as on modeling of forest cover evolution. 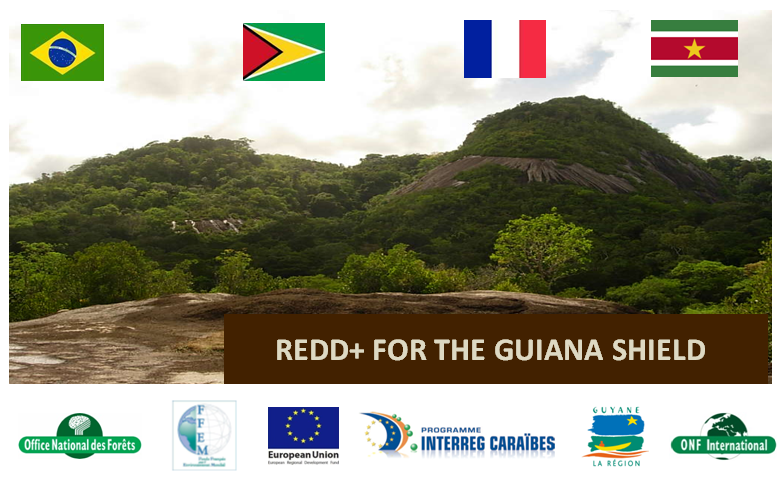 REDD+ for the Guiana Shield is funded by the Regional Development European Fund (FEDER) through the Interreg IV Caraïbes program (1.26 M€), the French Global Environmental Facility (FFEM –1 M€), the French Guiana Region (90 k€), as well as by the project partners own contributions (see the project summary for more details). Financing Agreements with donors were signed in late 2012 and the project officially started in January 2013.